"You're going to have to point Orbison out to me. I don't come out this way much - too much security," he says. "Of course, for a few million, I can swing it. Heck, letting those other guys get there a little before us means that they can draw the heat instead of us." They're currently about a half-mile above the ground: high enough to avoid being spotted by casual observers, and low enough that they can see the mansions lit up in the dark. And the mansions are lit up - in fact, it seems every house in North Bay has decided to go all out on Christmas this year, making the place a veritable light show. There are moving lights, strobe lights, static lights and flashing lights. Large lights, small lights, inbetween lights, dim, dark and bright lights. Practically every mansion looks like they've hired George Lucas to retell some aspect of Christmas on their extensive front laws and on the roof of their large houses. You come to Orbison Drive easily enough, though you aren't sure which is number 108. Satori believes it to be at the East end, as he swears the numbers begin at 'one' on the Western edge. Flying over, you can't see any signs of supervillains breaking into any houses, but you do see a steady stream of traffic and people walking up the street, all taking turns at checking out the light shows on display. "He have a fancy pool or something, you know, something that's easy to see? I got radar on this thing, but it's not good enough to read the street signs," Heavy says. "Doesn't look like anybody beat us here, or if they did, they went in quiet." He flies a little lower to aid Satori in spotting something familiar from his searches. His speed is nearly 200 miles per hour, and if they went too low, things would move by so fast that Satori wouldn't be able to see much of anything. Heavy does his part to try to help, though he isn't much help, as he expected. "Would it be possible to hover for a short while? I have binoculars. With them, I should be able to make out house numbers from here." "No problem. I can't make out anything anyway, what with all those lights down there," Heavy says. He slows up and stops in mid-air. He does his best to re-adjust Satori so he's in a comfortable position, or really, so that he doesn't have to worry about dropping him. Inside his head, he's going, "Why is it that I never get to hold up the hot super-villain chicks like this? It's always mechas and ninjas." 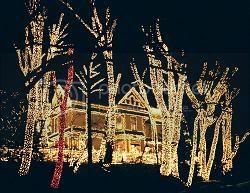 You find the house you believe to be Adam's eventually, managing not to be seen by all the people down below dazzled by the flashing lights. It, like the others, is all lit up. It's hard to tell if anyone is home - all the lights are on inside and there are multiple cars parked outside closed garage doors, but the place looks still. It's a large, two storey affair with a large swimming pool out back and the rear of the property being lost in woodlands. There is a back door and multiple windows on both floors, as well as a couple in the roof which are possible entrances. There's also a guard house at the front gate, but currently the guard is standing at the closed gates talking to passer-bys. "There," Satori points. "That one. We can land either in the woods out back, or on the roof." "I got a thing for roofs tonight, looks like," Heavy says. "Santa is coming early this year. You want me to do anything special in the approach? You're better at breaking and entering than I am." This last part is evident from the way that Satori sneaked into the meeting, while Heavy went the normal route. While Satori answers his question, he begins to head towards the roof. He won't actually land on it, preferring to float slightly above it so that he doesn't end up with the same problem that the Englishman had back in Southside. "Try to approach from /that/ particular angle. It will mean that the guards have to look towards bright lights and up to see us, which will cut down their odds of doing so successfully, but will not silouhette us against a high-contrast part of the skyline. Once I reach the roof, I will see about dealing with alarm systems and opening one of the upper doors." Heavy does his best to follow Satori's directions. What he says sounds like it makes some sense. Even though his armor looks a lot like Daedalus' armor from a distance, the main difference - its color, a gunmetal gray - means that he doesn't reflect the light the way that Daedalus' burnished copper armor does. Since most of what he does works better when no one can see him, he's grateful that Talos left that part of his father's invention intact. He stops just above the roof, and gestures for Satori to get off. At this point, he's running silent, only speaking when absolutely necessary. He realizes he forgot to tell Satori about that quirk of his, but shrugs. Ninja shouldn't mind somebody not yapping all the time.